I had the usual breakfast yesterday, and an almond mid-morning snack. 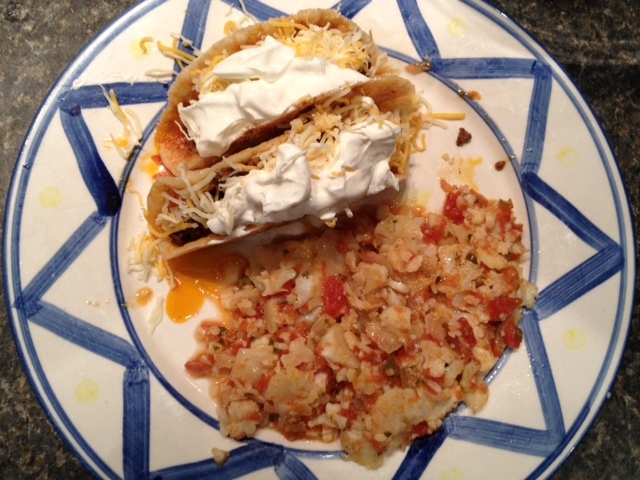 After work, I created 2 tacos from leftover seasoned meat and provolone shells. The Mexican rice warmed up well. Day 50 and I’m still going strong. I’ve had a couple of disappointments on the scale, but the clothes keep getting looser. And–with Rick’s help–this has been fairly easy. The recipes that create mock food items, like spaghetti squash and cauliflower mashed potatoes, make me feel like I’m not missing anything. The high-fat and protein dishes keep me feeling full, and also keep me from feeling cravings when others around me eat sweets or bread. Yesterday started with my egg breakfast, followed by a yogurt lunch and an almond snack. By dinner time, I was ready to experiment with something tasty. I cooked some hamburger in taco seasoning and prepared 2 slices of provolone cheese “taco shells.” Then I took out my trusty cauliflower and a recipe Brandon gave me for Mexican rice. He found it here, tried it, and had very good results. I grated the cauliflower, then put the rice-like substance in the microwave for 5 minutes. In the meantime, I put 3 tbsp of butter and a 1/2 cup of onion in a saute pan. When the onion was translucent, I added about 2 cups of the cauliflower and 1/2 cup of salsa. The recipe called for a “small” head of cauliflower, but even using only 3/4 of it seemed too much and it didn’t look very colorful. I added another 1/2 cup of salsa. The results were pretty impressive. It looked and tasted like Mexican rice! Eureka! Another great substitute. I felt like I was eating an authentic Mexican meal (well, authentic “American Mexican”, at least). It was no Xochimilco, but it was as good or better than Taco Bell. I totally forgot that I have some Costco guacamole in the fridge. I guess I’ll use that for tonight’s leftovers. I know I added at least 2 more grams of carbs by doubling the salsa, but the results were pretty good. Rick had leftover spaghetti, and it didn’t bother me in the least. I’m really not craving the pasta with these great available substitutes for the starchy things I used to eat. We ate quickly, then set off to pick up our friends Wally and Karl from the airport. Our home is close enough to DTW to make us a handy shuttle service. Upon our return, dessert was the usual chocolate mousse.